How packaging solutions can increase your product’s success? Back home page > Sector news > How packaging solutions can increase your product’s success? According to marketing studies, customers usually only take about seven seconds on average to develop a first impression about a particular product or brand. So very often product packaging becomes the single deciding factor as to whether or not someone makes a purchase. Product packaging will influence a consumers’ decision on whether to pay the price asked for your product. Whether you pack fresh, cooked, frozen, or dried fruits and vegetables, there is an ideal packaging ready! Egyptian company Tasdeer Holding continues to represent a successful example of joint efforts of 13 manufacturing entities with 40 years of experience in the packaging field. Thanks to Egypt’s strategic location and its international cooperation through various free trade agreements, company exports to 40 countries with significant presence in the EMEA region and still counting. Considering the insatiable need for packaging nowadays, Tasdeer Holding is proud of its wide umbrella of products. Here stands its uniqueness, as the company serves numerous business sectors through diverse packaging categories. Focusing on this special market, company became one of the leaders in printed Flexible Packaging and Plastic Film manufacturing, along with its easy to use Stand-up Pouches. As for the Disposables, it manufactures Plastic Containers as hinged-lid containers and the newly launched Punnets and Perforated Fruit Bags. Finally, the fruit Wrapping Sheets and customizable Boxes & Cartons, in addition to Paper Bags & Sacs catch retailers’ and food manufacturers’ attention. 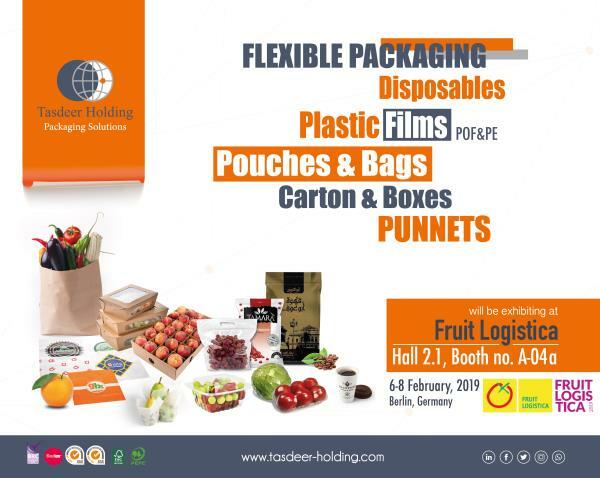 Tasdeer Holding exhibits at Fruit Logistica, Berlin and welcome you on their Stand A-04a, Hall 2.1.